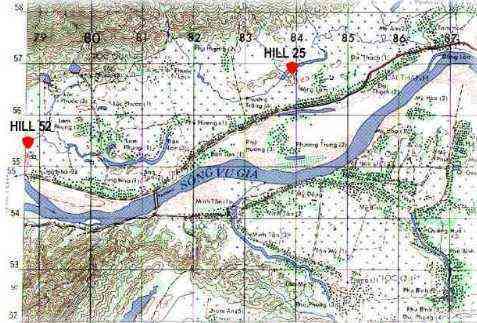 Doc provided us this information on Hill 25, also called "Dineen's Hill". There are a few links at the bottom of this page for descriptions of the assault, and photos of the aftermath. To the north was Charlie's Ridge. The foothills were about a mile away from us. The mountains rise up fast to 2,000 - 3,000 feet. We made several squad size patrols up the side of the mountain but I don't think we ever went over the top. There was a cave up there and at night Charlie would use a light to send messages to the valley. We would call in artillery and he would just go back into his cave and come out when it was over. I was inside this cave once, never did see Charlie but he took a parting shot at us when we left to just let us know he was there. We had alot of successful ambushes of trails coming off that mountain. That is why Hill 25 was a thorn in their side. We set right in the middle of one of their trail systems. They would come down from the mountain to cross over into Arizona territory.